Secluded Guest Suite with Your Own Private Spa. Hillside Haven Guest Suite is located in beautiful Auke Bay Alaska. We are located 1/8 of a mile past the Alaska Marine Highway Ferry Dock on a secluded piece of property just steps from Auke Nu Cove, a perfect place to launch your kayak adventure, and backed by Tongass National Forest where the hiking opportunities are limitless. Auke Bay is a great place to start your fishing day for halibut and salmon or if you prefer, a whale watching tour to watch feeding Humpback or Orca whales. Watch eagles soar over the cove or perched up in a tree from outside your window, deer eating new green shoots of grass in the spring, or the occasional black bear patrolling the area in the fall all from your front deck. Our newly built accommodation is peaceful and private with plenty of room to relax and take in the beauty of a true Alaskan experience. Come enjoy the Alaska that is waiting for you outside your front door. We have lived in different areas of Alaska for the past 17 years. We are a very active family that loves to travel and explore. We love camping, boating and doing anything active in this incredibly beautiful country we live in. We truly enjoy meeting new people and are always excited to help travelers enjoy the most of Juneau. We built this vacation rental in this area so others could experience the quiet, peaceful and beautiful surrounds that we see every day. 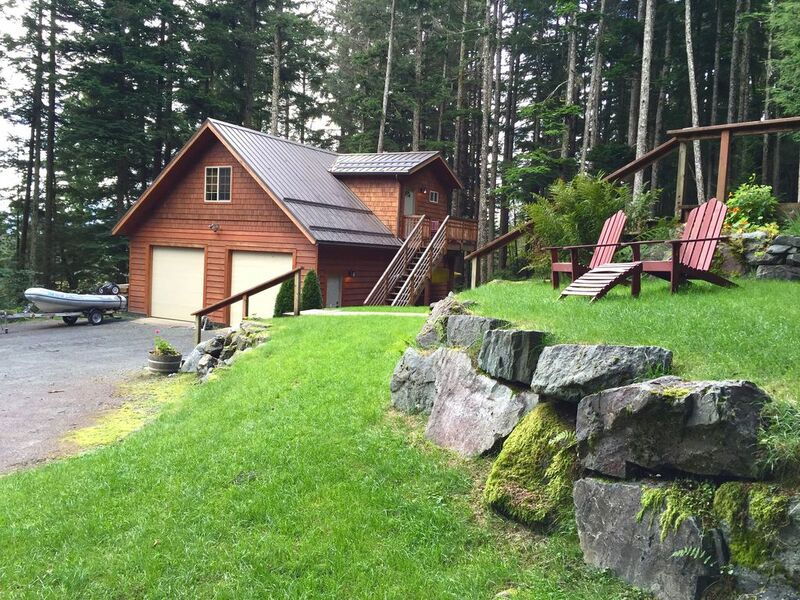 Hillside Haven Guest Suite offers a relaxing get away in the Auke Bay area of Juneau. It has an enclosed steam shower with a two person whirlpool tub, full kitchen, an amazing view of Auke Nu Cove, a huge bedroom and radiant in floor heat. We are close enough that you can walk to the Alaska Marine Highway Terminal or Auke Bay recreational area. The suite is in a separate building with your own private entrance. 1 bathroom with spa unit. Steam shower, jetted tub, rain shower, radio and more. You can see the ebb and flow of the tide below at Auke Nu Cove and the beautiful bay area of Auke Bay all from the living room window. We had a great time in Juneau. It was relaxing coming come to the house every night for a week. The kids enjoyed hiking in the national park behind their property and walking down to the beach just down the road. It was quiet, clean, and relaxing! It was great being able to do laundry! Hillside Haven and the Abbas family were perfect hosts, and the guest apartment they built was an ideal location for celebrating our 35th anniversary to escape the Texas summer heat for the stunning beauty of Juneau. The view from the living room and breakfast area was an inlet of the bay, where we could watch boats, gulls and the tide. Another window gave us a stunning view of the forest. There are some natural trails and creeks running through their property, which backs up to the Tongass National Forest. Theresa’s hospitality was superb, and when she and Tommy went fishing one morning and caught a huge halibut, they shared the meat with us for that evening’s dinner. Theresa also hand-gathers seaweed from islands in the vicinity, and makes seasonings and snacks from it. I bought some to take home, it was absolutely delicious (and very nutritious). The apartment is beautifully-appointed with nice furnishings and luxurious bedding and towels. The rainforest shower already has us making plans for remodeling our bathroom at home! We were in the area for the week to visit our daughter who lives in downtown Juneau and were looking for somewhere outside of town to stay. Well, what we found was perfect! Turn left and you're a short drive to civilization. Turn right and you're "out the road" . Great place for couples who are looking for a taste of real Alaska. It's close to some much....Saint Theresa's, Mendenhall Glacier Park, The Docks, Auke Bay...the list goes on and on. And the food (the food and coffee from Gonzo AK, the fish and chips at the Sandbar and Grill, the coffee and the WATER. Such a magical place. Theresa and Tommy have a beautiful place. We slept great, eat great and had a wonderful time! Gracious host. Clean and comfortable. Close to ferry dock and marina. It was absolutely amazing! We didn't want to leave!!! This is a quaint little suite that has a great view of Auke Bay from the living room window. My husband particularly enjoyed trying to spot eagles feeding at low tide from the comfy chair in the living room. There is a very comfortable king bed in the bedroom with a good amount of space for your things. The kitchen was stocked with a number of nonperishable food items so I would suggest taking a good look before buying groceries. Safeway and Fred Myer are perhaps 10-15 minutes away. There are also some bathroom items including a hairdryer. A car is a must and you have to drive up a very steep hill to get to the suite but we had no problem. If you carry a lot of luggage you may not enjoy climbing the outside stairs but we were traveling light so no problem. The owner, Theresa, was fantastic and gave us some great local insights while we were visiting. We loved the easy access to the activities we had planned. It's about a 15 minute drive to the airport and Mendenhall Glacier and about 20 minutes to downtown Juneau. We enjoyed walking across and down the road a little ways into the Auke Bay recreation area which is quite pretty. I would definitely stay here again! Located in beautiful Auke Bay, Hillside Haven is 1 mile from the Auke Bay (Don Statter) Marina, 4 miles from the airport and 13 miles from downtown. Away from the cruise ship crowds of downtown, Auke Bay offers a peaceful relaxed setting with breathtaking views and boundless outdoor opportunities.